You might think that all your debts are equal. In your mind, there might not be any difference between your auto loan, student loan, and credit card bills. If you stop paying secured debt, you might lose your home, car, or other assets. If you stop paying unsecured debt, your credit score will take a major hit, but you won't lose your shelter or your car. Secured debt is tied to an asset. Think of mortgages and auto loans. In a mortgage, the money you borrow is connected to your home, which your lenders consider collateral. If you stop making your payments, your lender can start foreclosure proceedings to take possession of your home. In an auto loan, your car serves as collateral. If you stop making payments on this debt, your lender can take possession of your car. The collateral on secured debts is a way for lenders to protect themselves when passing out large loans. Borrowers aren't as likely to stop making payments if they know doing so could cost them an asset. And if borrowers do stop making payments, lenders can recover some of their losses by taking possession of the collateral and selling it. Unsecured debt does not have any collateral behind it and is not tied to any asset. The most common kind of unsecured debt is credit card debt. Student loan debt and medical bills are also examples of unsecured debt. If you fall behind on unsecured debt, your lenders generally have no collateral to take over. This is a big deal: Lenders rely on your credit score to determine if you qualify for loans and at what interest rate. If your score is too low, you'll struggle to earn approval for loans. And if you do get that approval, the higher interest rates will make borrowing money more expensive. Lenders can also take steps to force you to start paying what you owe on unsecured debts. They can hire a debt collector. They can also sue you to garnish your wages or put a lien on your assets to get you to pay. Which should you pay first? If you are hit with a financial crisis, and you can't pay all your bills on time for the month, it usually makes sense to pay your secured debts first. You don't want to take the chance of losing your home, car, or other assets. 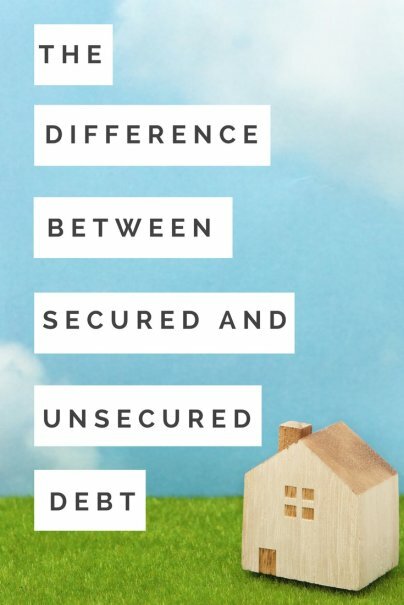 Secured debts tend to be larger, too. For most people, the mortgage payment is the biggest bill they pay each month. It can be more difficult to catch up on missed payments if you fall behind on these larger bills. The most common type of unsecured debt, credit cards, also come with more flexibility. You only have to pay the minimum required monthly payment on your credit card debt to avoid being hit with a late fee. You might pay off your secured debts first and then have enough money to pay at least the minimum on your credit cards. Interest rates might play a role, too. Unsecured debt generally comes with higher interest rates. If you fall behind on these payments, the amount you owe can build quickly because of these higher rates. Skipping two or three credit card payments can quickly boost your overall debt on your cards. Ideally, you'd never have to prioritize unsecured or secured debts, but would rather pay all your bills on time each month. But if you must make the difficult decision of which bills to pay and which to wait on, knowing the difference between secured and unsecured debt can help you make that call.